As the media blockade continues in Pakistan, the country seems to have gone behind a virtual wall. The series of events have left the country isolated and nobody seems to know what is happening there. As per reports, even after the civilian government asking the Pakistan Army for help, the Commander 111 brigade, which generally takes minutes to enter the capital, has not been seen anywhere. A number of protestors are still on the roads and have been raising slogans. The army's reluctance in showing competence, when the nation perhaps needs it the most, may be encouraging the hardliners more with assurance of protection. Earlier on Saturday, a number of reports claimed that the troops were called in Islamabad to restore peace after a police crackdown on protestors went violent, but it turned out the army wasn't deployed . According to sources, the civilian government requested the Commander 111 Brigade directly, as per the mail that was leaked to the Pakistan media, violating the protocol. The proper channel would have been through the Chief of Army Staff General (COAS), Qamar Javed Bajwa. Several hours later, there was no sign of any army movement in Islamabad or Rawalpindi. A statement of Pakistan's Ministry of Interior read, ".....is pleased to authorize deployment of sufficient number of troops of Pakistan Army to be determined by the Commander 111 Brigade, in aid of civil power, to control law and order situation in Islamabad Capital Territory with effect from November 25 till further orders." Reportedly, major social networking sites, including Facebook and Twitter, have also been blocked in the country. 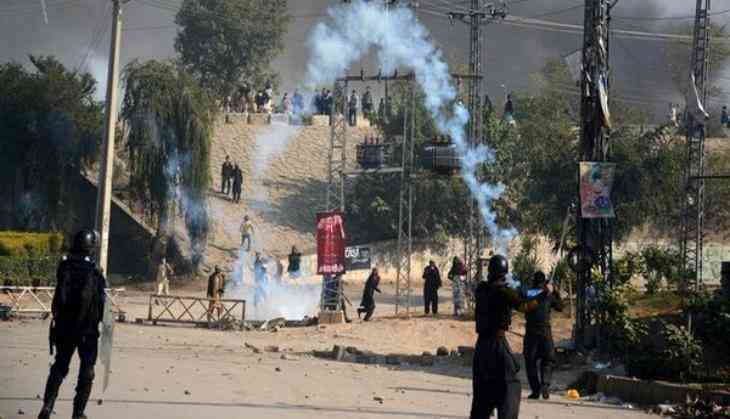 As per the reports, one security official died and over 200 people were injured after the law enforcement agencies clashed with a cleric's supporters, who have been camping at national highway leading to Rawalpindi. The cleric, Khadim Hussain Rizvi, and his followers were demanding resignation of Pakistani law minister Zahid Hamid, as they saw the change in the words of an oath taken by the lawmakers as blasphemy. Though the change has been reversed, the protestors continue to demand Hamid's resignation. On Saturday, the Pakistan Electronic Media Regulatory Authority (PEMRA) warned it would not cover Faizabad sit-in during a police crackdown on the protestors. Following the PEMRA order, there was a media blackout in Islamabad, where almost all leading private TV channels went off air. The PEMRA has also directed the law enforcement agencies to make strict security arrangements for the staff present in different media outlets across the country.